I always thought I was a verbal mind. But the SATs proved me wrong 20 years ago; I scored 100 points higher in math. WHAT? HOW? I had stopped math after the required geometry. Nonetheless – I have always enjoyed number-related puzzles rather than verbal ones like crossword puzzles. With numbers I always thought I had the power to figure it out eventually; a proven answer! I jumped on the Sudoku bandwagon a few years ago, but lost interest quickly aside from the boring train rides where I’m stuck with an amNY that I read in 5 minutes. 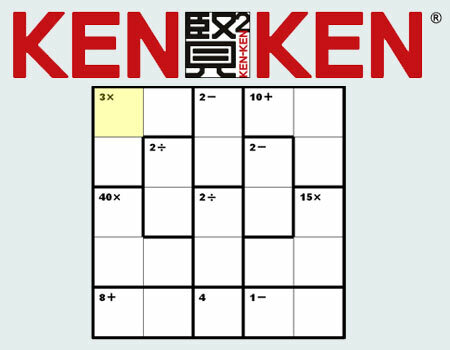 Recently the amNY and the New York Times have introduced a new puzzle: KenKen. Invented by Japanese math teacher, Tetsuya Miyamoto, KENKEN® allows you to test your puzzle acumen and improve your math skills at the same time. It’s a puzzle that promises to make me SMARTER. I figure I hate regular exercise, but I can use some brain flexing … especially now that I’m unemployed (again).